WATERVILLE -- Apparently, Messalonskee and Skowhegan would be pretty good in Class B, too. WATERVILLE — Apparently, Messalonskee and Skowhegan would be pretty good in Class B, too. 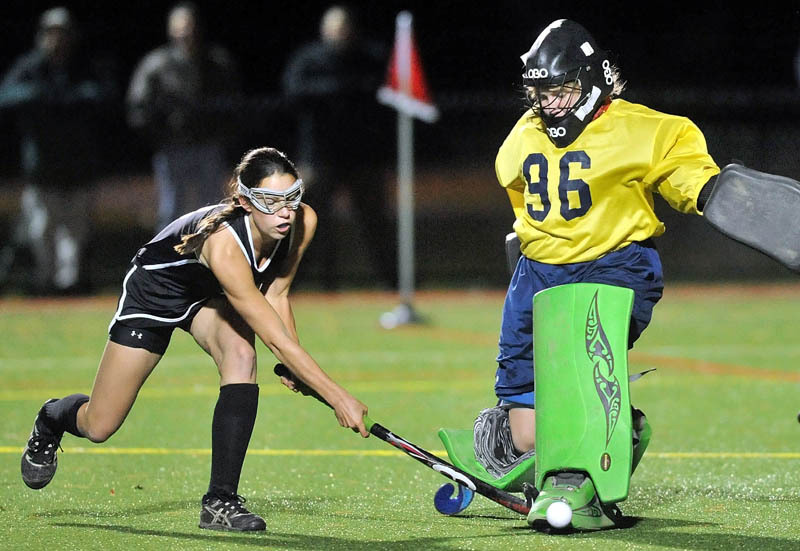 As usual, those two teams took part in the Kennebec Valley Athletic Conference championship field hockey games, but this year, there was a different format. The top finisher in Class A by Heal points played the top finisher in Class B, and the two runners-up also played a crossover game. On a very chilly Thursday night at Thomas College, Messalonskee beat Nokomis 6-0 and Skowhegan posted an 8-0 victory over Belfast. Skowhegan coach Paula Doughty was in favor of the switch, and said the results didn’t change her opinion. In the first game, Messalonskee scored twice in the first three minutes and coasted to the win. 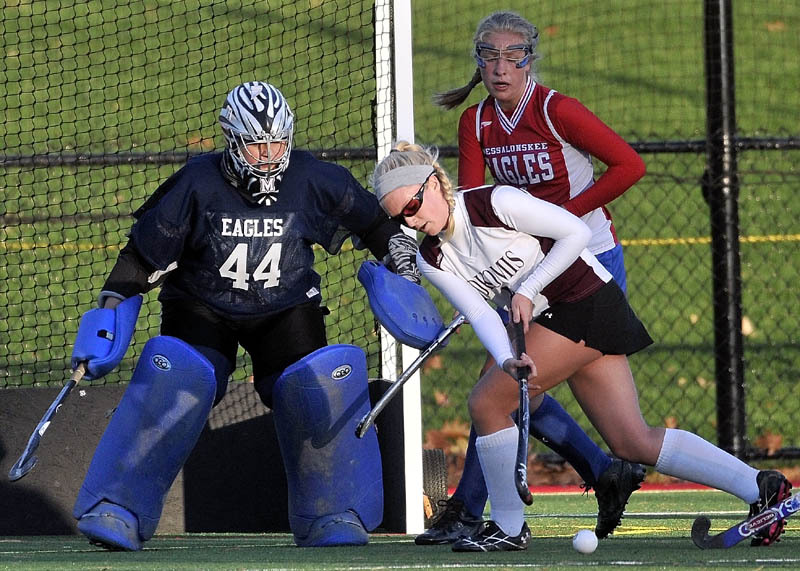 Emily York scored three goals for the Eagles, Kristy Bernatchez added two and Lynnae Luettich had one. While York said, “We just came out and tried as hard as we can. We want to play like it’s going to be in the state championship game,” Nokomis coach Katie Thompson said her team took a different approach. Naturally, Messalonskee’s skill caused all that action. At the beginning of the game, the Eagles darted and dashed around the Nokomis defenders and continued their high skill level the rest of the night. “There’s a bunch of adjustments that we’re working on and practicing, so this was a great opportunity,” Messalonskee coach Katie McLaughlin said. Skowhegan’s Makaela Michonski had five goals in the second game, including three in the first half. Indians defender AJ Martineau said her team looked at the game the same way Messalonskee looked at its game. “We approached it as any other game: We need to win and we need to have as much passion as we can to beat this team,” Martineau said. Sarah Finnemore, Renee Wright and Rylie Blanchett also scored for Skowhegan. The night ended showcasing some great field hockey, if not two competitive games.